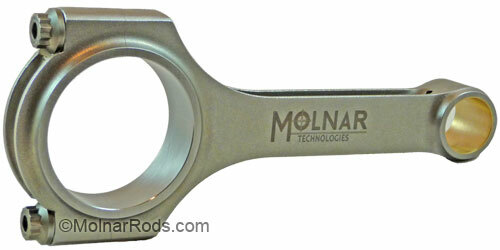 We have a huge variety of Molnar rods available to cover many different applications. New products and part numbers are being added constantly. If you do not find rods for your engine with the specifications you require, please do not hesitate to contact us and we will be happy to help you. Click on the links below to view the available piston rods for your engine. Do you guys have F20b SIR Honda Accord rods? Thank you for visiting our site and taking the time to check with us on the F20b rods. At this time Molnar Technologies is not manufacturing a connecting rod set for the Honda F20b engine. I am not aware of any aftermarket manufacturer currently making a performance rod set for that engine. Make rods for 5.0 late model coyote engine? Thank you for visiting our site and taking the time to ask us your question about connecting rods for the 5.0 Coyote engine.